Completed in 2008, the Oslo Opera House (Operahuset in Norwegian) reflects the landscape of Norway and also the aesthetics of its people. The government wanted the new Opera House to become a cultural landmark for Norway. They launched an international competition and invited the public to review the proposals. Some 70,000 residents responded. Out of 350 entries, they chose the Norwegian architecture firm, Snøhetta. Here are highlights of the built design. Approaching the house of the Norwegian National Opera and Ballet from the harbor in Oslo, you may imagine that the building is an enormous glacier sliding into the fjord. White granite combines with Italian marble to create the illusion of glistening ice. The sloping roof angles down to the water like a jagged chunk of frozen water. In winter, natural ice flows make this architecture indistinguishable from its environment. Architects from Snøhetta proposed a building that would become an integral part of the City of Oslo. Connecting land and sea, the Opera House would seem to rise up from the fjord. The sculpted landscape would become not just a theater for opera and ballet, but also a plaza open to the public. Along with Snøhetta, the project team included Theatre Projects Consultants (Theatre Design); Brekke Strand Akustikk and Arup Acoustic (Acoustic Design); Reinertsen Engineering, Ingenior Per Rasmussen, Erichsen & Horgen (Engineers); Stagsbygg (Project Manager); Scandiaconsult (Contractor); The Norwegian company, Veidekke (Construction); and the art installations were accomplished by Kristian Blystad, Kalle Grude, Jorunn Sannes, Astrid Løvaas and Kirsten Wagle. From the ground, the roof of the Oslo Opera House slopes steeply up, creating an expansive walkway past the high glass windows of the interior foyer. Visitors can stroll up the incline, stand directly over the main theater, and enjoy views of Oslo and the fjord. Builders in Norway are not encumbered by the European Union safety codes. There are no handrails to hamper views at the Oslo Opera House. Ledges and dips in the stone walkway force pedestrians to watch their steps and focus on their surroundings. The architects at Snøhetta worked closely with artists to integrate details that would capture the play of light and shadow. Walkways and the roof plaza are paved with slabs of La Facciata, a brilliant white Italian marble. Designed by artists Kristian Blystad, Kalle Grude, and Jorunn Sannes, the slabs form a complex, non-repetitive pattern of cuts, ledges, and textures. Aluminum cladding around the stage tower is punched with convex and concave spheres. Artists Astrid Løvaas and Kirsten Wagle borrowed from old weaving patterns to create the design. The main entrance to the Oslo Opera House is through a crevasse beneath the lowest portion of the sloping roof. Inside, the sense of height is breathtaking. Clusters of slim white columns angle up, branching toward the vaulting ceiling. Light floods through windows that soar as high as 15 meters. 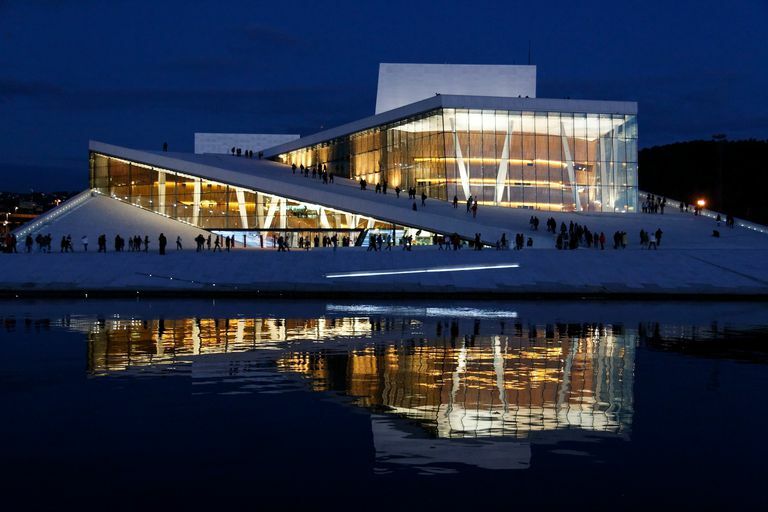 With 1,100 rooms, including three performance spaces, Oslo Opera House has a total area of about 38,500 square meters (415,000 square feet). Designing windows 15 meters high poses special challenges. The enormous window panes at the Oslo Opera House needed support, but the architects wanted to minimize the use of columns and steel frames. To give the panes strength, glass fins, secured with small steel fittings, were sandwiched inside the windows. Also, for window panes this large, the glass itself needed to be especially strong. Thick glass tends to take on a green color. For better transparency, the architects selected extra clear glass manufactured with low iron content. On the southern façade of the Oslo Opera House, solar panels cover 300 square meters of the window surface. The photovoltaic system helps power the Opera House by generating an estimated 20 618 kilowatt hours of electricity a year. A variety of art projects throughout the Oslo Opera House explore the building's space, color, light, and texture. Shown here are perforated wall panels by artist Olafur Eliasson. Encompassing 340 square meters, the panels surround three detached concrete roof supports and take their inspiration from the glacial shape of the roof above. Three-dimensional hexagonal openings in the panels are illuminated from the floor and from behind with beams of white and green light. The lights fade in and out, creating shifting shadows and the illusion of slowly melting ice. The interior of the Oslo Opera House is a stark contrast from the glacial landscape of white marble. At the heart of the architecture is a majestic Wave Wall made from strips of golden oak. Designed by Norwegian boat builders, the wall curves around the main auditorium and flows organically into timber stairways leading into the upper levels. The curved wood design within glass is reminiscent of the EMPAC, the Experimental Media and Performing Arts Center on the campus of Rensselaer Polytechnic Institute in Troy, New York. As an American performing arts venue constructed at roughly the same time (2003-2008) as the Oslo Operahuset, EMPAC has been described as a wooden ship seemingly hung inside a glass bottle. If wood and glass dominate many of the peripheral public spaces, stone and water inform the interior design of this men's restroom. "Our projects are examples of attitudes rather than designs," the Snohetta firm has said. "Human interaction shapes the spaces we design and how we operate." Moving through glowing wooden corridors at the Oslo Opera House has been compared to the sensation of gliding inside a musical instrument. This is an apt metaphor: the narrow oak slats that form the walls help modulate sound. They absorb noise in passageways and enhance acoustics inside the main theater. The random patterns of oak slats also bring warmth to the galleries and passageways. Capturing light and shadows, the golden oak suggests a gently glowing fire. The main theater at Oslo Opera House seats approximately 1,370 in a classic horseshoe shape. Here the oak has been darkened with ammonia, bringing richness and intimacy to the space. Overhead, an oval chandelier casts a cool, diffused light through 5,800 hand-cast crystals. The architects and engineers for the Oslo Opera House designed the theater to place the audience as close as possible to the stage and also to provide the best possible acoustics. As they planned the theater, the designers created 243 computer-animated models and tested sound quality inside each one. The auditorium has a 1.9-second reverberation, which is exceptional for a theater of this type. Balconies at the side of the theater reflect sound down to the audience, while balconies at the rear send sounds in multiple directions. The oval ceiling reflector reflects sounds. Convex panels along the rear walls help spread sound evenly through the theater. Mobile towers with timber slats modulate sound according to their wavelengths. Dense oak material along the balcony fronts and the rear wall resist high-frequency vibrations. The main stage is one of three theaters in addition to various offices and rehearsal spaces. The Norwegian National Opera and Ballet by Snohetta is the foundation for a sweeping urban renewal of Oslo's once-industrial waterfront Bjørvika area. The high glass windows designed by Snøhetta offer public views of ballet rehearsals and workshops, counterpoint to the neighboring construction cranes. On warm days, the marble-paved roof becomes an appealing site for picnics and sunbathing, as Oslo is reborn before the public's eyes. Oslo's expansive urban development plan calls for redirecting traffic through a new tunnel, the Bjørvika Tunnel completed in 2010, constructed beneath the fjord. Streets around the Opera House have been transformed into pedestrian plazas. Oslo's library and the world-famous Munch Museum, which houses works by Norwegian painter Edvard Munch, will be relocated to new buildings adjacent to the Opera House. The home of the Norwegian National Opera & Ballet has anchored the redevelopment of Oslo's harbor. The Barcode Project, where a string of young architects have created multi-use residential buildings, has given the city a verticality not known before. Oslo Opera House has become a lively cultural center and a monumental symbol for modern Norway. And Oslo has become a destination city for modern Norwegian architecture. 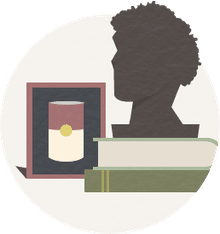 Who Was Jørn Utzon? Ask Sydney. Can you build special buildings for the visually impaired?